BENTON HARBOR, Mich., January 4, 2017 -- Whirlpool Corporation is celebrating the conclusion of its first-ever Global Habitat Build Project -- a project which engaged more than 200 Whirlpool Corporation employee volunteers in 14 Habitat for Humanity home build projects in eight countries. 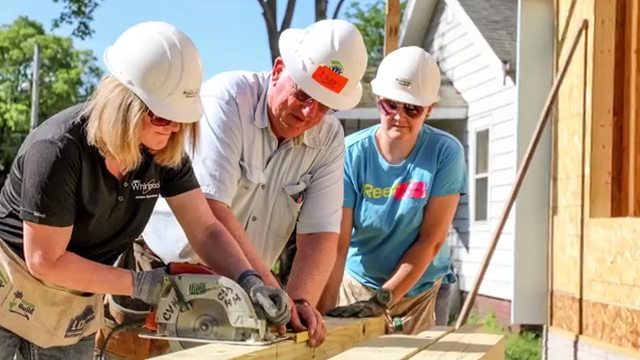 The project was coordinated to recognize the many contributions of the company’s former CEO, Jeff Fettig, who stepped down as CEO on October 31 of this year, and to celebrate the 17-year partnership between Habitat for Humanity International and Whirlpool Corporation. Throughout the fall of 2017, Whirlpool Corporation's Global Habitat Build Project included home builds in the following cities: New Delhi; Pondicherry, India; Hong Kong; Shanghai; Guangzhou, China; Warsaw, Poland; Sao Paulo; Bogotá, Colombia; Buenos Aires, Argentina; Monterrey, Mexico; Bloomington, Ind., U.S.; Marion, Ohio, U.S.; and Benton Harbor, Mich., U.S. Since 1999, Whirlpool Corporation's partnership with Habitat for Humanity International has supported the organization's work through product donations, financial contributions, and volunteerism on the part of Whirlpool Corporation employees. More information on Whirlpool Corporation's work with Habitat for Humanity is available here.